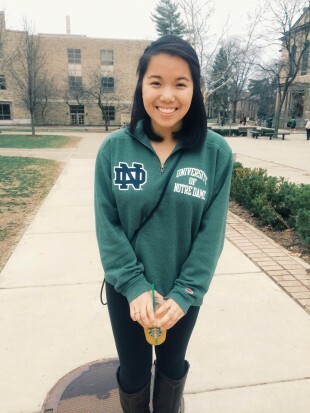 I am a Business and German double major at the University of Notre Dame. I am the Academic Commissioner and Senate representative of my residence hall, Howard Hall. I also serve on the Departments of Resident Life and Constituent Services within Student Government. In the following year, I will work as an Economics and German private tutor at the Learning Resource Center. I will also act as the treasurer for NAMI, a student club raising awareness for mental illness which affect students our age. I grew up traveling often with my family and have visited over twenty countries to date. I am fluent in three dialects of Chinese and speak conversational Spanish. I am looking to add German to my repertoire in my years at Notre Dame. Summer language study will allow for accelerated language acquisition and in-depth experience of Germany as an economic capital and a culturally-rich European nation. I have taken German courses at Notre Dame for only a year and this will be my first exposure to authentic German culture. A summer in Munich will allow me to better understand the structure and complex aspects German, and help me to learn how to speak and think in German. I believe increased confidence in my ability and growth in the German language will catapult my education at Notre Dame. I plan to be able to speak more often at German cultural activities, such as Kaffeestunde and German Club. During my stay, I will gain insight on topics of importance in Germany and in Europe, such as economic and political affairs. To be in the center of Europe’s economic powerhouse would be enlightening and enrich discussion for future business and German classes. I am an intended Business and German double major, with a special interest in International Studies. After graduation, I plan to work and then earn my MBA in Germany. Exposure to Germany and mastery of German, along with Chinese, Spanish, and English, will make me an attractive applicant to employers and graduate schools. I hope to make great progress toward my ultimate goal of fluency. By the end of my study, I hope to be able to communicate ideas in German and be able to conduct basic conversation as well as become well-versed in German affairs. I hope to achieve a better understanding of the German language through an intensive learning course at the Carl Duisberg Center and self-study as well as extensive use of the city of Munich as a resource. The SLA grant allows me to experience Germany and the German language first hand, and this opportunity will expand my horizons academically, intellectually and culturally. At the end of the summer, I will be able to communicate in German about topics of importance in German society, such as political affairs. At the end of the summer, I will be able to attain a more complex repertoire of German vocabulary. At the end of summer, I will be able to speak, read, write and listen at a level of proficiency equal to one semester beyond my current German coursework placement at Notre Dame. At the end of the summer, I will be able to recognize when I have made an error and employ self-correction. My 8-week stay in Munich will allow me to explore all that this cultural and economic capital has to offer. Through the Carl-Duisberg Center’s Leisure and Culture Program, I will practice German while taking tours of Munich and nearby towns as well as its museums and participating in sporting activities. In addition, I plan to attend cultural events throughout the summer, such as the Munich Fil Festival and Bavarian State Opera, and experience the standard of living in Germany while practicing the German language with locals. I will become well-versed in the arts, history, and daily affairs of Germany. I will participate in Treffam, a gathering of international families who practice the German language while volunteering. Activities range from working in a soup kitchen to giving English lessons to children. I will be able to interact with many other language learners through Treffam as well as give back to the Munich as well as the international community. I will volunteer through Green City, a local organization which emphasizes the importance of environmentalism in Munich. Through Green City, I will not only be able to converse about an issue which I’m passionate about, but also make a change in my local environment while using the German language. It’s hard to believe that I have already been in Munich for one week. Everything, especially the menial tasks you never thought about, becomes a challenge. At first, this means that you have to use phrases like “Ich verstehe das nicht” (I don’t understand this) and “Konnen Sie mir helfen bitte?” (Can you please help me?) more often than you would like. As time goes on, though, I have come to realize that each moment here is as challenging as it is rewarding. I’ve to appreciate the rapid, inevitable improvement that I’ve already made in German conversation simply from interacting with locals, asking for directions and recommendations, and making new friends. It comes naturally. That is perhaps one of the most beautiful things I’ve found in Munich – this wonderful and complete immersion in language and culture. I currently take classes five days a week in the mornings for 4 hours and 30 minutes a day. We are reviewing many of the topics I have learned in German class at Notre Dame, and putting the grammar and new vocabulary learned in the classroom to practical use. In the following week, I will be moving on to a higher level of German classes and will be learning new material. I look forward to being able to further expand my language learning, alongside my fellow classmates, who I’ve already come to be very close with. I did not anticipate such a diverse class. My peers range in ethnicity and nationality as well as age. It makes for very interesting conversation and a strong emphasis on the use of German (as opposed to our mother languages) in the classroom, since we all speak different languages. Outside of class, I have been able to practice my German language as well as practice Chinese and Spanish. It has been very rewarding to meet so many people of different background, with the common goal of becoming more proficient in German. When I asked a Japanese classmate how she felt about her stay in Germany thus far, she told me that she often missed home, as the Japanese are a minority here in Germany. As an older student who does not speak English, she said she had a difficult transition at first, but after living in Munich for a month, she has met many natives as well as international students and is now improving upon her German and her English. I found out that many older students come to Germany to learn German in order to get a job here. I’ve also met another girl who is taking a gap year from her university in Korea to learn German. She would like to pursue her Masters in Germany. She says that she wants to study here in Germany because there is so much culture, especially in Munich. It’s been a wonderful experience meeting so many people from different walks of life and sharing a desire to learn German with them. Hallo! Wie geht’s? Es geht mir gut! Diese Woche war super! I’ve survived the initial jet lag and transition and have now developed a good routine here. I feel like I’ve only just gotten here and yet it’s already been two weeks! I’ve now moved onto level B1 in my German language course and I find this class a much better fit. There is still some review, but I think it’s good to go over some rather difficult topics once more – especially adjective endings and prepositions! Having German languages every day for nearly five hours proves to be very effective – I can already see the progress I’m making toward bettering my German grammar. In addition, now that I am settles, I’ve finally ventured outside of the school and explored Munich. This has been a week of immersion! This past Monday was Whit Monday, which is in short a holiday during which the Germans observe the Second Day of Pentecost. As you may know, German stores are for the most part closed during Sundays and all national holidays (with the exception of choice stores in train stations and some tourist areas). This basically means that there’s a bit of a mad scramble to buy all the groceries you need for the week on Saturday, which is what I found myself doing on my first and second Saturday in Germany. It’s a little bit inconvenient and evidently a transition for me, but I appreciate the sentiment of a day of rest. Sundays here are meant to spent with family and friends, and not working. You’ll find most Germans hanging out in parks, restaurants, and biergartens (which are of course still open because there may or may not be riots if you cut off Germans from their beer supply!). Alright, until next week! There’s so much to see and do and learn – life at its best, really! I’ve just come home from Innsbruck, Austria – one of the most beautiful places in Europe I’ve been yet. Innsbruck is a small city just outside of Bayern, about an hour and a half’s train ride (mit dem Schnellbahn) from Munich. It’s completely surrounded by mountains, which offers a majestic backdrop for an already breathtaking city. I must have wandered through the cobblestoned streets for hours just looking at the architecture and popping into the many churches scattered throughout the town. I only stopped a few times to ask for directions to specific sights – in German, of course, since German is spoken in Austria. For the most part, I let myself get lost in the crowds of people and the sights and the colors. It felt good to be “lost in the right direction,” as my dad would say. Literally speaking, Innsbruck is small enough that you could walk from one end to the other in a day easily, so as long as you travel in one direction, you really can’t get too lost. I get the sense that people come here to get lost all the time, though, and also to find themselves. Looking out at those mountains and sitting next to the rushing water of the Inn River, which runs through Switzerland, Austria, and Germany, you can’t help but feel the magic. I’ve been in Germany for three weeks now, and I’m starting to explore the areas in the vicinity of Munich. Bayern borders the countries of Switzerland, Austria, and the Czech Republic, all of which I plan to visit this summer. Many people in these lands speak fluent German, but no so much English, so it’s good for me to get out and practice with no safety net to fall back on. I’m finding that I never truly leave the classroom – because Europe has become the classroom itself! And while I am not always doing exercises in a workbook or analyzing texts, the learning process never really stops. I can hear myself thinking in German sometimes, and it always gives me a jolt of emotion that’s a cross between disbelief and happiness. Before I came here, I could barely string together five minutes of conversation without prior preparation and a case of nerves, and now I find myself having talks with my German friends – full-fledged, relaxed conversations that run relatively smoothly. I’m becoming comfortable with the nuances of the German language and I’ve started to do things like intuitively throw verbs to the end of the sentence and learn the article of a word with the word itself. I’m even starting to use words like “doch,” which has no English equivalent and can really only be explained as a commonly used means of emphasis here in Germany. Between learning German in every moment and hearing it everywhere I go, I’m developing this intuition for the language and I think that alone is my greatest achievement since arriving. I feel I can only learn faster as I begin to travel and meet more people. Today I came across a writing exercise I completed a few years ago. I was completing a time-series journal, which is basically a daily journaling commitment for an allotted number of years (for me, three). Each day, a question or prompt is presented and through consistent journaling throughout the years, you’re able to literally see the change in your person as time passes. On this date (July 12nd), the prompt is: What is something you can do today that you couldn’t last year? This year, my answer is simple: I can speak German. It’s very short and simple, and it perfectly sums up my experiences this summer. And if I’d been asked a year ago how I envisioned this summer, I probably would have answered, with a certain amount of practicality, “Internship. Job experience. Work.” I’m very, very glad things didn’t go as planned. There are some mornings when it hits me all over again in the first few moments of consciousness that I’m waking up in Munich, Germany. And then I walk outside, and I find that I’m not just hearing German anymore – I’m listening and finding that I can catch more than bits and pieces now. My ear for German has improved by leaps (thanks to lots of eavesdropping!). Just the other day, I overheard a conversation in which two Germans were trying to find the English equivalent for “Zufall,” (coincidence) and having had similar problems with German words more than I can recall, I was all too happy to help them. There was a nice moment of satisfaction when the two Germans exclaimed “Ja, genau!” (Yes, exactly!). It’s moments like these that remind me not only of how far I’ve come, but also of how I got here. Not everyone, especially students my age, get the chance to travel and spend the whole summer learning a language, so again, I would like to thank my donors and Notre Dame for giving me this great opportunity. I’m coming close to the end of my stay in Germany, with only a little over three weeks left. Munich has really become home. I’ve grown accustomed to the German way of life, and I think I’ll even miss the Sundays that I found so odd upon arrival. The quiet streets and closed shops now seem normal to me, and I’ve adopted the German way of spending time in parks with friends and family on the weekends. I’ve realized, after a bit of travel, that Munich has truly become home. I will miss the Bayerish people, with their sometimes chaotisch und compliziert (chaotic and complicated) accents. I will also miss all the museums, galleries, and parks that make Munich the Kulturstadt (cultural city) that it is. During my time here, I have visited many local and popular museums, including BMW Welt, which is indeed laid out in the shape of a car engine, Deutsches Museum, which is a must when studying German, and all of the Pinakotheks (picture galleries), as the people of Munich are very proud of their art galleries. Through simply wandering the city, I’ve picked up so much vocabulary that I wouldn’t normally encounter in a textbook at home. Germans have a penchant for stringing already known words together to form even longer and more complicated words, and I’ve made it a sort of mission this summer to find longer and longer words. Zum Beispiel (for example), there is a law that governs the production labeling of beef – Rindfleischetikettierungsüberwachungsaufgabenübertragungsgesetz. I was pretty proud when I came across this one – but remembering it and saying it all at once is another story! Hallo! Since last week, I have visited and revisited many sights (Sehenswürdigkeiten) in Munich. It must be the pending end to the summer that has me reminiscent of biergartens and Pinakotheks (picture galleries). It’s a different experience walking through places like Mariensplatz, one of Munich’s main squares, and having lunch in the Englischer Garten, now that I’ve lived here for a summer. Sometimes I will see tourists and give them directions to their next destination, in German first and then in English if they speak no German. Once in a while, I’ll meet a German and have a good conversation (which is a bit rare since Germans aren’t much ones for small talk) without having to excuse my German. I’m glad I chose to spend 9 weeks in Germany, because when I leave, I will no longer be saying, “Ich spreche nur ein bisschen Deutsch” (I speak only a bit of German). I feel like I did what I came here to do and more. I’ve not only learned much more German, but developed a feel for how things should sound. I’ve now accumulated a repertoire of vocabulary that can be used on the daily as well as more elegant structures the Germans call “Hochdeutsch” (high German). I’ve learned to self-correct, which was one of my main goals at the beginning of the summer. More than all of that, though, I’ve developed an even deeper understanding and appreciation of German than I began this summer with. I am confident that this is a language I will one day soon be able to completely and fluently express myself in. This is my last week in Munich, and my room is already looking uncomfortably empty. I will be finishing my classes at the end of this week, and then heading to visit a few friends around Germany (in Berlin, Heidelberg, and vielleicht (maybe) Freiberg)– all the while practicing German, of course! I went to a bookstore with some classmates today and picked up a German book, which will hopefully be comprehensible given the last few weeks, to read on the road. I’ll also be purchasing the workbook for the next level of German (B2) before I leave the school, and will steadily be making my way through it during my travels and also when I return home. I’ll miss hearing, speaking, and seeing German everywhere I go, and I’ll definitely keep practicing for this reason, and for fear of letting my German become unpracticed and stale – Ich habe große Angst davor (I have a great fear for that!). I will also of course miss the people of Bayern and their wonderful ways of life. I will be frequenting the biergartens this week to say all my goodbyes, thank all the German friends I have made here for helping me and dealing with my broken German, and of course add the great memories I have collected here and will cherish when I leave. I couldn’t have asked for a better group of people or a better place to learn German. Ich werde unbedingt diese wunderbare Stadt vermissen (I will undoubtedly miss this wonderful city). Two weeks later, I’m back at Notre Dame, and about to continue my German studies. I’ve had so much time to reflect on this summer and all the experiences I’ve been so fortunate to have. It honestly blows my mind, how far I’ve come not only as a language learner, but also as a student and a person. It seems unbelievable to think that two months can make that much of a difference, but it only took so long for me to make a home of Munich, Germany, to meet people I consider good friends, and perhaps most impressively, to conduct capable and comfortable conversation in German. I miss Germany a lot. When I first came back to New York, it was all I could do not to say “Entschuldigung” instead of “excuse me” or speak like I’ve learned to think in German. I hadn’t realized that I’d picked up so many quirks of the Germans until I began to use English full-time. There were things I wanted to communicate that I couldn’t quite say in English, because there was either no English equivalent of a word or it was a concept so inherently German that the full meaning couldn’t be explained without having experienced it. I tried to explain the word “fernweh” to many people when I came back. The closest English equivalent is “wanderlust,” which as it turns out, is also derived from the Germans. Taken apart, it literally means “far-sickness,” and it is meant to describe those who seek out travel often. It feel cheap, though, to only leave the definition of fernweh as such, because it also describes a love of learning, of culture and language, of new things, of history, and of people. It is not impossible to explain, but it certainly takes more than a few sentences. And it is a word that is so inherently German because that is how the Germans see themselves. I’ve found that German isn’t a language most would call beautiful, as it sounds not nearly as fluid and wispy as French, nor does it have the abundant and perhaps superfluous vocabulary of English. It is a practical language, one meant for a people who believe in getting to the point. So when I come across a word like “fernweh,” I can’t help but admire the beauty of its construction. I like to think that all languages have such words, which stand out because they say so much about the history and the people they came from. I’m glad to be home, and I know it won’t be too long before I return to Germany. Once again, I would like to sincerely thank Notre Dame and my donors for enabling me to spend a life-changing summer doing what I love best – learning and traveling. It’s truly been an unforgettable experience.